Armley Mills is one of Leeds most haunted buildings. Fright Nights West Yorkshire will take you on a ghost hunt to uncover the history and hauntings at this amazing venue. Locally the mills are renowned for being haunted with visitors and staff reporting paranormal experiences. There are many reports of shadowy figures and the sounds of children laughing and people coughing, you may even hear a whisper from ‘Harold’ said to be the main haunter of the location. Often people have claimed to have been touched by dis-incarnate hands, while others have had ghost hunting equipment snatched out of their hands by mysterious forces. Whatever your beliefs this is going to be a night to remember! The earliest record of Armley Mills dates from the middle of the sixteenth century when local clothier Richard Booth leased ‘Armley Mills’ from Henry Saville. A document of 1707 provides the first description of the mills. ‘That Fulling Mill in Armley… containing two wheels and four stocks… also the water corn mill and all the fulling mills… containing one wheel and two stocks.’ By 1788 Armley was equipped with five waterwheels powering eighteen fulling stocks. Over the next hundred and seventy years, Armley Mills became a hive of activity producing wool and cloth and exporting its wares to North and South America, Europe and the Far East. In 1804 Benjamin Gott agreed to buy Armley Mills but in the November of 1805 the mill was almost entirely destroyed by fire. Gott re-built the mill from fireproof materials, using brick and iron wherever possible. It is Gott’s mill which survives largely intact to this day. In 1907 the woollen clothing manufacturers Bentley and Tempest, who had been one of several tenants, became the sole occupiers of Armley Mills. Like many other textile mills, Armley could not cope with the combination of the loss of markets as the British Empire split up and in 1969 the mill finally closed. Since 1983, the mill has been known as the Leeds Industrial Museum. 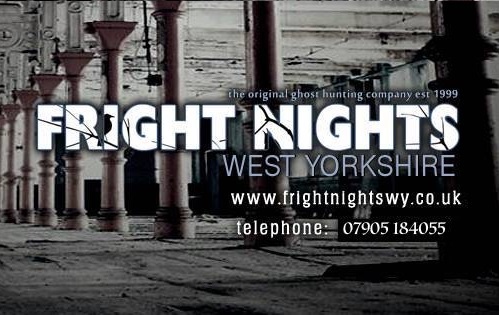 Fright Nights West Yorkshire have hired Armley Mills for the night for this special ghost hunt. You are joined by experienced paranormal investigators and medium to try and experience paranormal activity in one of the most haunted mills. Full use of Ghost Hunting and Psychic equipment will be provided as well as hot refreshments through the night. Please note: Over 18’s only and NO pregnant women allowed as dictated by our insurers. Many venues are unsuitable for disabled guests due to the nature of the building, but if in doubt, please contact us for more information. NO accommodation is provided unless specifically detailed. In purchasing a ticket for this event you agree to abide by our Terms & Conditions which can find in full here. All our events are fully insured, and a First Aider will be present. This event is organised by Fright Nights West Yorkshire. With thanks to Jon Wright of Fright Nights West Yorkshire for the Research & Detailed Write-up for this event. Event categories: Ghost Hunts.Event tags: Apparition, Castle, Divination, Elemental, Expert, Friday, Fright, Fright Nights, Ghost, Ghost Hunts, Ghosts, Glass Divination, Haunted, Haunted House, House, Hunt, Mansion, Medium, Mills, Nights, Paranormal, Paranormal Investigation, Poltergeist, Saturday, Séance, Spirit, Spirits, Table Tipping, Venue, and Workhouse.